Step into the grand, glass-fronted building of Westfield Sydney off Pitt Street Mall and it becomes clear that this shopping centre boasts the allure of retail therapy on a whole new level. From the concierge with its exquisitely marbled counter to the array of plush, lily-pad-shaped couches dotted around the 6 levels of tempting designer and franchised stores, this is far from the local shopping plazas of my childhood. A food lovers dream, Food on Five is located within the complex that is an upmarket, slightly more sophisticated food court that is a far cry from plastic cutlery and fast food chains that we are used to. Food ordered from the eateries is served on real white crockery (when eaten in, not taken away) and is of top-notch quality, even if it means that prices are a little higher than at a typical food court. But take the escalator up to the sixth level and you'll be greeted with a quieter atmosphere and a handful of tempting restaurants, with food that would suit those with a longer lunch break. 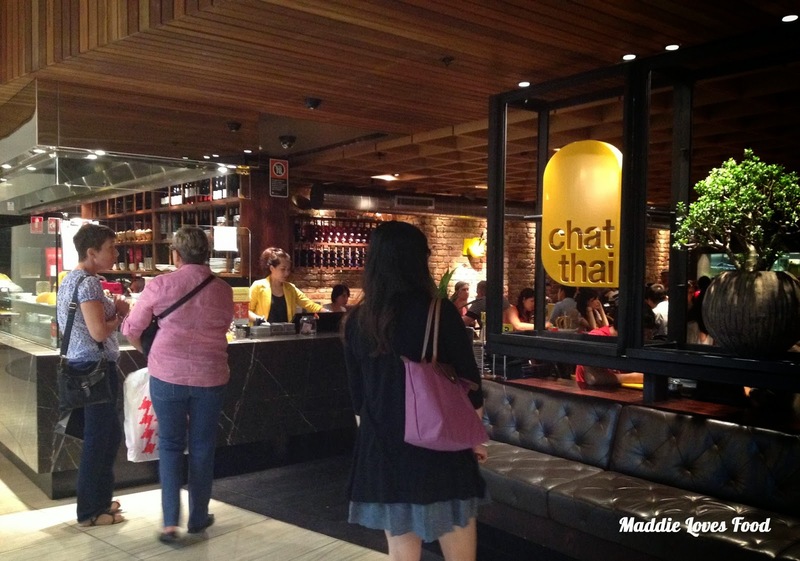 Chat Thai stands among these restaurants, its front kitchen - where chefs make salads and prepare a plethora of authentic Thai sweets - encased behind a glass window where passers-by can stop and take a little peek. I'd come with a good friend for lunch on a weekday, and arriving just after 12pm it was almost already half full. The good thing about this being a restaurant within another complex (ie. Westfield) is that it caters for both those who want a fast, cheaper lunch and those who'd like to enjoy a slightly more sophisticated, lazy lunch. I'd come with a friend, and we ordered a couple of yummy dishes to share and talk over. 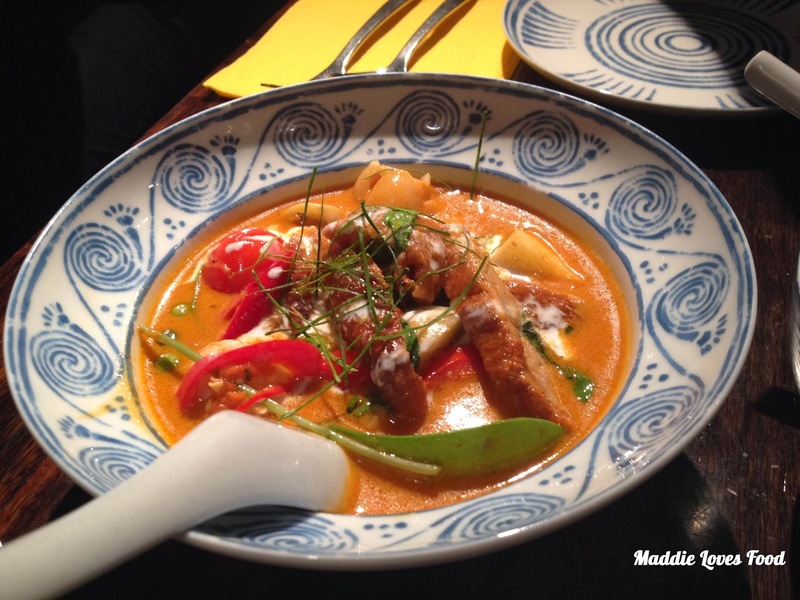 The red curry of roasted duck comes out first, glistening in an exotic blue serving bowl that holds bite-sized pieces of roast duck, holy basil, capsicum, snow peas, tiny red and green cherry tomatoes, lychee and pineapple. 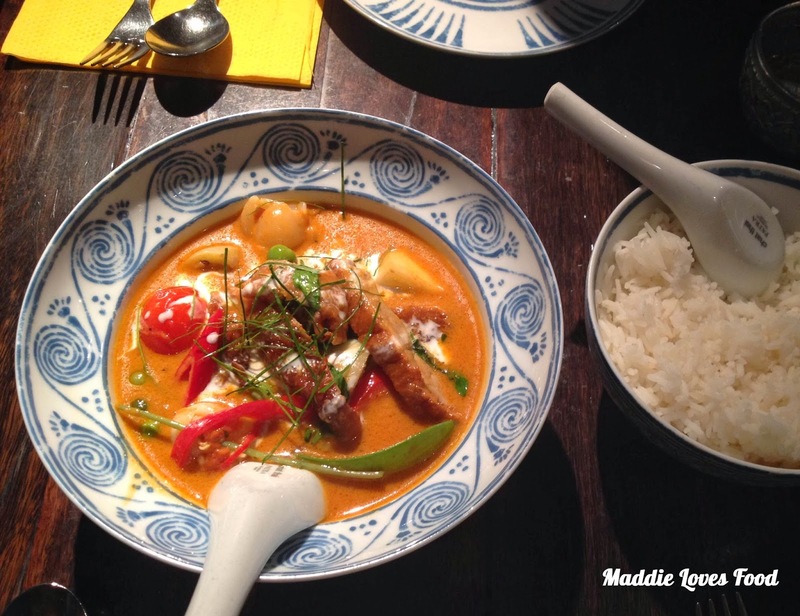 The addition of tropical fruit gave the curry a sweet burst and complemented the spiciness nicely. The holy basil was something I hadn't experienced much of before, which added a slight anise flavour. 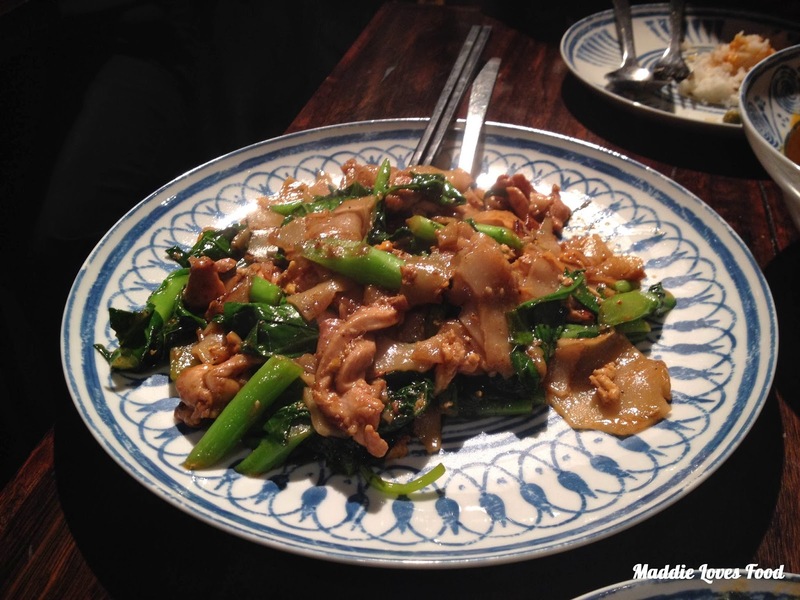 Pad Si-Ew is a popular Thai stir-fried noodle dish that appeals to both young and old as it's not spicy at all. Char Thai's Pad Si-Ew comes as a jumble of wide, slippery rice noodles, chicken and Chinese kale and is deliciously addictive. The slick noodles are wider than most versions and are hard to pick up if you aren't too skilled with chopsticks, but possess a smoky, charred flavour that is yummy and not too salty. Some diners beside us share Pad Thai, King Prawns and Satay, and others have an individual bowl of soup noodles all to themselves. The variety of the menu is excellent. This is one of those crowd-pleaser restaurants that manages to offer popular dishes and authentic cuisine without compromising quality, and if we'd had more people we'd would have loved to order from all corners of the expansive menu, especially the amazing sweets and Thai desserts. Lunch for the two of us cost just over $15 a head, which isn't too bad considering the generous serving sizes and quality of the food. 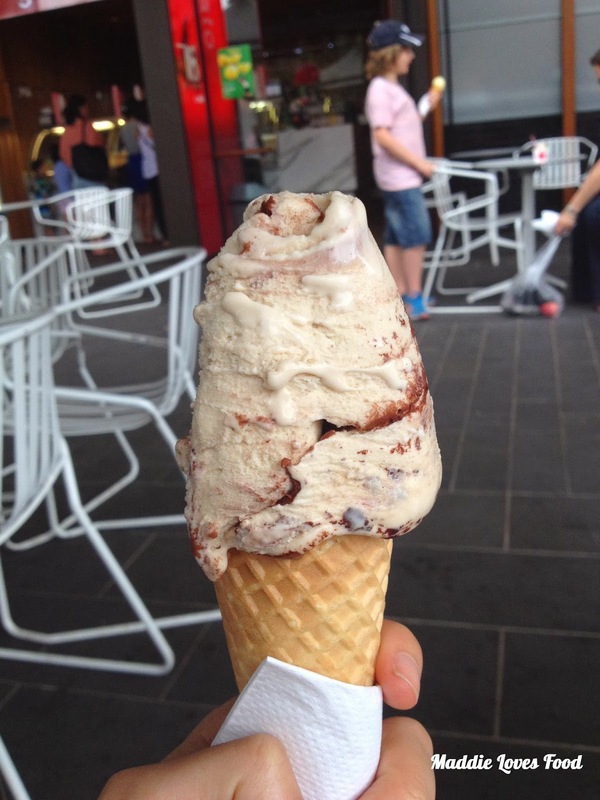 This was just a quick pic I just had to share with you of the dessert we sought out a couple of hours after our yummy, satisfying meal - a Tiramisu Gelato from Meno Diciotto in Darling Quarter. What better way is there to end a meal?